Mr. Schueler has created over 100 television programs in the past 20 years that have been broadcast throughout the country and around the world. A former teacher, Mr. Schueler focuses on educational and social issues creating children's programming, cultural and social documentaries, and family series television. His clients have ranged from the United Nations and the American Indian Science and Engineering Society to the CBS Network Foundation and the PBS Television Network. He has received 20 Emmy® Awards for his work as well as the Grand Award for Children's Programming, NY Festivals; two International Iris Awards; the Award for the Advancement of Learning through Broadcasting, National Education Association; two Service to Children's Television Awards, National Broadcasters Association; two Excellence in Community Service Awards, CBS Television Network and the Parent's Choice Award. He has been named "Innovator of the Year" by the National Broadcast Association of Community Affairs. Mr. Belinoff is one of social marketing's most innovative and creative forces for change in the public health sector. Over the past 15 years he has brought his expertise in brand development, strategic planning and marketing and communication campaign development and execution to the world of issue and policy communication and advertising for the public good. He has worked with Christopher Productions for over a dozen years and is based in Los Angeles. His clients in advertising, marketing and social marketing strategic planning have included the World Health Organization, The Center for Disease Prevention and Control, Modello Brewing Foundation (Mexico City), and California Department of Health Services. Dr. Nathanson has worked with Christopher Productions since 1991, when he co-created the nationally syndicated, Emmy Award-winning "NEWS 101" program for youth. A nationally recognized figure in the field of law and aging and public policy affecting the elderly, he is currently the Chair of the Board of the National Committee to Preserve Social Security and Medicare. He was a founding member of the American Bar Association Commission on the Elderly, was the President of the American Society on Aging and the National Secretary of the Gray Panthers. Professor Nathanson's areas of expertise include law and public policy, legislation and lobbying, community organizing and the law of Non-governmental Organizations in developing countries. He is on the boards of the National Senior Citizens Law Center, the International Center for Not for Profit Law and is theChair of the Board of KNME public television. Ms. Frank has 25 years of experience in television editing, programming and production management. Prior to television production she worked in the radio industry as a producer, writer and disc jockey. Ms. Frank holds a Bachelor's Degree. Mr. Blotz is an Emmy award-winning television journalist based in Minneapolis, Minnisota. With over fifteen years experience,he is an Anchor/Reporter with FOX O&O Affiliate KMSP-TV in Minneapolis. He has won several Associated Press honors, is an NPPA winning editor and has produced/ reported throughout the world. Mr. Blotz has worked with Christopher Productions as a field producer and creative consultant since 2001. Mr. Butler is a producer, writer, director based in Los Angeles who has over 20 years experience creating unique television projects. His programs include shows from the US Olympic committee to the CART Championship racing series that have achieved many awards including several Telly Awards.Mr. Butler's television career began in front of the camera with key roles in "Little House on the Prairie" and "Buffy the Vampire Slayer". He has worked with Christopher Productions as a field producer and creative consultant since 2001. Benjamin Nathanson worked closely with Christopher Productions to develop the Gran Sueno project in Nicaragua. While working on the Gran Sueno project, Benjamin served as a Peace Corps volunteer. During his tenure as a PCV he assisted the Nicaraguan Ministry of Health with the development of health related radio and television programming. Prior to entering the Peace Corps, Benjamin focused part of his undergraduate education at Northwestern University on entertainment education. He assisted Population Communications International with a radio novela in Peru that dealt with HIV/AIDS and family planning. Benjamin is currently pursuing his Masters degree in Public Policy at Johns Hopkins University. The focus of his work is on international healthcare policy. Mr. McComas has over 20 years experience as a producer, photographer and editor. 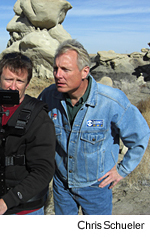 Mr. McComas has worked in network television, and has also photographed several California, Arizona, New Mexico and Federal government documentaries. Mr. Gallup has over 15 years of experience in feature film, television, commercials, and news broadcasting. Mr. Gallup specializes in film and video production in addition to "over the shoulder" long form documentary production. Mr. Renner has over 15 years experience in location film and television audio. His credits include both long form documentary as well as live broadcasts including CNN, National Geographic, A&E, Dateline and The Today Show. Ms. Potis is an award winning editor with over 20 years of experience as a video editor, writer, producer and director in television programming and news broadcasting. Ms. Potis has also worked in magazine production management including content, design and layout. Mr. Thomkins has over 25 years of experience coast to coast as an art director for various network television affiliates. He has overseen entire station image campaigns and designed overall graphics and animations for programs ranging from documentary to award shows. Mr. Jolly has over 20 years of experience as a composer, arranger, performer and teacher. He holds a Masters Degree in music theory and composition and has scored a wide variety of television productions from documentaries to children's television series. Copyright © Christopher Productions LLC, 2002-2012. All rights reserved.